Astonishing vapers across the globe is the all new VooPoo DRAG 157W Gene Chip TC Box Mod and its record-breaking 0.025 second firing speed. With dimensions of 90mm x 54mm x 24mm, this mod has a burly Zinc Alloy chassis that displays a sleek Carbon Fiber inlay on one side and a laser-etched “DRAG” on the other. The laser-etched side of the chassis doubles as a large battery access door held firmly in place by two strong magnets. 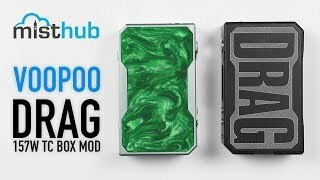 This unique access door can be easily removed to insert two 18650 batteries (not included) providing the VooPoo Drag with a maximum output current of 40 amps. On the inside, VooPoo installed a battery strap so you can easily pop your batteries out when the time comes to replace them. At the bottom of the device, VooPoo equipped the mod with several battery venting holes that provide adequate battery ventilation as the internal temperature of the device increases. The DRAG features an enlarged firing button and two adjustment buttons that sit next to the bright OLED display. This crisp display is home to a plethora of settings, thanks to the smart 32-bit Gene Chip. You can view or customize the firing temperature between 200 to 600F, as well as alter the Variable Wattage anywhere from 5 to 157W. Temperature control supports the traditional Ni200 Nickel, Titanium, and Stainless Steel wires. The Gene Chip recommends “easily adjustable ideal output settings” that make it easy for beginners who don’t quite know which settings will work best for them when vaping. The mod also brightly displays the DRAG’s current battery life, so you can always keep track of when your device is running low on power. With a five bank memory, this mod allows you to save multiple settings, so you don’t have to go through the trouble of fine-tuning your personal adjustments each time you change the batteries. Making the most of Micro-USB functionality, VooPoo equipped this mod with upgradable firmware which enables the user to download the VooPoo PC app to customize the device settings and logo. With Low-Voltage, Current, Short-Circuit, Low-Resistance, Overheating, and Timeout Protection, the VooPoo DRAG 157W Gene Chip TC Box Mod is both powerful and safe, providing an incredibly user-friendly device that is sure to satisfy beginner vapers and veterans alike.